When considering investment option, individual investors often have to deal with the dilemma of choosing between a Fixed Deposit and Income funds. This often leaves them at crossroads. 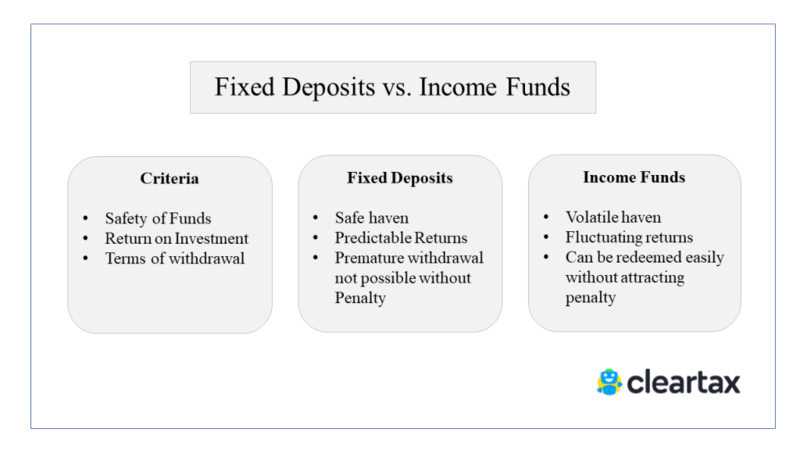 Explained here are the two investment options of fixed deposits and income funds so that it is easier for you to make your choice. What are the Terms of Withdrawal? 1. What are Fixed Deposits? Fixed deposits are also known as term deposit and refer to a sum of money that an investor chooses to deposit at the bank or financial institution for a fixed term thereby earning interest at a specified percentage for that duration. On completion of the term, the initial deposit is returned to the investor. a. A Fixed Deposit is the safest form of investment. It gives you guaranteed returns post-maturity. For instance, stock markets or real estate investments come with a risk of money loss; especially when the stock market crashes or if there is a depreciation in property value. b. A Fixed Deposit gives the account holder higher interest rates when compared to a normal savings account. This is a good way of parking your extra cash and earning dividends off it. c. Fixed Deposits can be of great help in times of a cash crunch. If you ever need money in a rush, you needn’t apply for a Personal Loan to deal with the emergency. You can always opt for a loan against your Fixed Deposit. Banks grant you a loan of up to 90% of the amount in your Fixed Deposit account at an interest rate that is lower than that of a personal loan. d. Flexibility is also an advantage when it comes to FDs. You can choose to deposit any amount as per your convenience for a specific tenure ranging from 7 days to 10 years. This way you can plan your savings better. The amount can be as low as Rs. 1,000. Plus, you have the option of withdrawal before maturity in case you need your money back immediately. 2. What are Income Funds? Income funds refer to types of mutual fund that primarily focus on generating income on a monthly or quarterly basis as opposed to capital appreciation. They may consist of various forms of money market instruments or company stocks that pay dividends to its shareholders. It, therefore, becomes increasingly important to obtain a clear understanding of the two and the pros and cons associated therewith. a. Income Funds are highly liquid. One can withdraw money any time, unlike in fixed deposits which come with a fixed lock-in period. b. These funds are actively managed and the aim is always to generate higher returns from varying interest rate cycles. Fixed deposits come with a risk of re-investment. The catch is when your deposit matures and you reinvest it, you can fall into a low-interest rate regime. In such a case, you would get lower returns than before. c. Income Funds are very tax efficient, more so if the investor is in the 20% – 30% tax bracket. Long-term capital gains (for holding over one year) attract a 10% tax without indexation, and 20% with indexation. However, gains from fixed deposits are taxed according to one’s income slab. Based on certain factors such as the investment horizon, safety & risk-factor, return on investment, withdrawal options, let us take a closer look at how these two options feature vis-a-vis for investment prospect. Fixed Deposit is a safe investment option as opposed to other risk-bearing options since deposits up to Rs. 1 lakh is insured. In an event of the bank defaulting the investor is given a principal amount up to Rs. 1 lakh depending on the amount that was deposited and the insurance cover. Besides this, the capital invested is rated by credit rating agencies and classified by factoring the securities and commodities that have been invested into. Income Funds are marred by volatile and fluctuating market rates and hence can be quite unpredictable. As such they may not provide a very effective hedge for the investments against the fluctuations of the market rates. The lack of rating system and over-dependence on financial analysis of investment portfolios call for investors with a high-risk appetite. Interest rates on fixed deposits are fixed and least subject to market turmoil. This provides stability to the investor as his/her investment if not prone to market volatility and financial planning becomes easy. As such the investor can easily calculate an expected amount to be received at the end of the investment. Income Deposits don’t offer a pre-determined rate of interest and it is subject to market fluctuations. There is an unpredictability factor involved as there is no guaranteed return on investment. The returns are based mainly on the dividends that the investor may earn based on the market fluctuations. The investments in fixed deposits are locked for a stipulated time period and hence the amount invested for that time cannot be withdrawn prematurely. In case of withdrawal before maturity period the fixed deposit needs to be broken drawing lower rate of interest and payment of a penalty. Income funds allow flexibility in withdrawal as investors can withdraw their investments at any time without losing out on their interest. The income fund need not be dissolved as there is no lock-in period for the invested amount. Penalties may be charged on exiting the fund within a short duration. It, therefore, ultimately lies with the investors to decide and choose between the two investment options or have a balanced mix of both to obtain a more diversified investing experience.